I hate to throw things away. Look in my freezer and you’ll find chicken bones for stock, egg whites frozen in ice-cube trays, and bags of leftover cornbread to make stuffing. My aim to make use of everything is a noble one although I sometimes find myself despairing in the face of so many bits and pieces to use up. After all, there’s only so many ways one can use a ham bone from Easter brunch or the two tablespoons of raspberry coulis leftover from dessert this spring. Of all the things that tend to build up in the freezer, it’s bread I tend to hoard the most. Hamburger buns, half-eaten sandwich loaves, dinner rolls, and even pastries stuff my freezer in hopes of being reincarnated into something else. Brioche, leftover from an early spring lunch, got a second act last week. Brioche requires time to make so I’ll gladly do whatever it takes to save it from being wasted. And while many will argue that making French Toast out of buttery brioche is decadence defined, I think it makes for a fine and delicious start to one’s day. The prep for this hot breakfast takes place the night before. Combine the ingredients and let them soak in their baking dish until morning. Before you shower and dress, slip them into a hot oven and they’ll be ready just in time for that first cup of hot coffee. In an effort to add a little panache to my breakfast, I baked the French toast in brioche tins in a nod to their beginnings. This makes for a pretty presentation although the dish will taste the same if baked in a muffin tin, ramekins or even an 8 x 8 inch casserole dish. For that matter, this recipe is ideal for using up any leftover bread and should not be limited to brioche. French or Italian bread, leftover from dinner, won’t leave any one complaining and the only prerequisite when considering which bread to use is that the bread be a bit old and stale for best results. 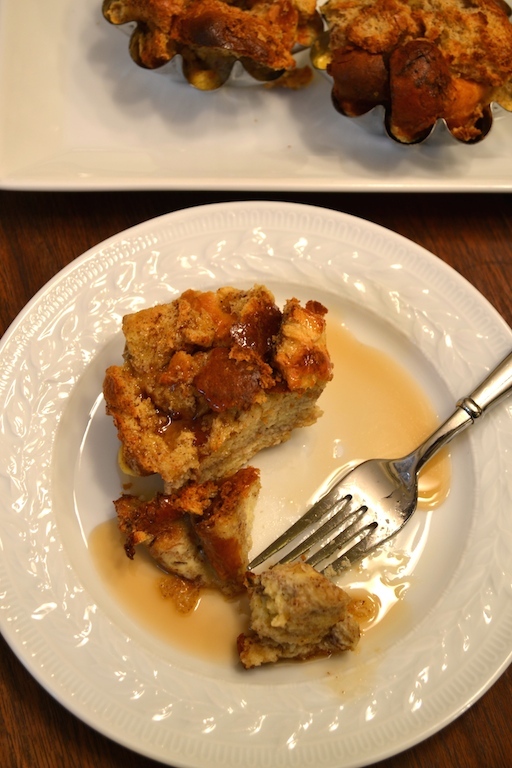 If you prefer your indulgence to take place in the evening, turn your stale bread into dessert with this recipe for apple and almond bread pudding. Or, if your taste buds prefer savory over sweet, enjoy this bacon, tomato, and mushroom strata. Suddenly makes you wish you had saved a bit more bread in your freezer, doesn’t it? 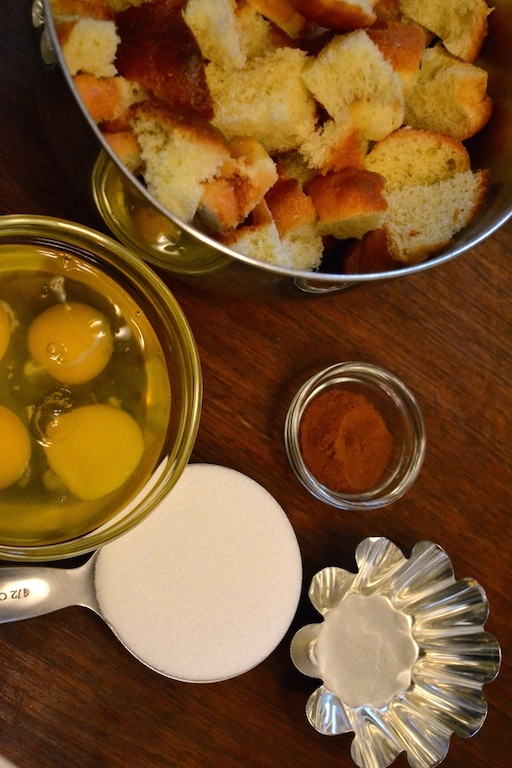 Store-bought brioche can certainly be used in this recipe with great success, but you might enjoy making your own brioche and using any leftovers for this breakfast treat. You can find my recipe for brioche rolls here. I bake this French Toast in brioche tins, but ramekins, muffin tins, or even an 8-inch by 8-inch casserole dish work equally well. Grease brioche tins, muffin tins, ramekins or an 8-inch by 8-inch square-baking dish with butter. Place the cubed bread in a large bowl. In a medium bowl, lightly beat the eggs and then add the milk, sugar, cinnamon, and vanilla extract. Stir to combine. Pour the egg mixture over the bread pieces and toss to coat. Spoon the bread mixture into the brioche tins or the baking dish and pour any remaining liquid over the top of the bread. Cover and refrigerate overnight or at least thirty minutes. Preheat the oven to 350 degrees. 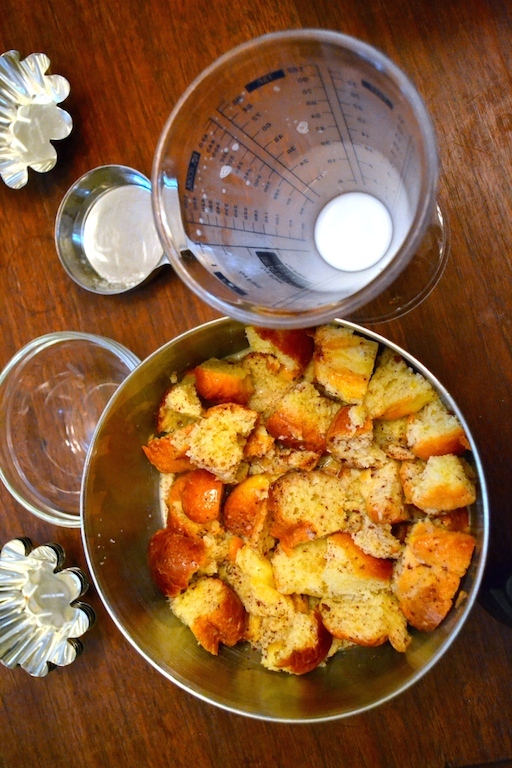 If using brioche tins or ramekins, place them on a large baking sheet and bake for about 30 minutes in the oven. If using a muffin tin, simply place the muffin tin in the oven and bake for 30 minutes. If using a casserole dish, place the dish directly in the oven and bake for 45-50 minutes or until the French Toast is just set. 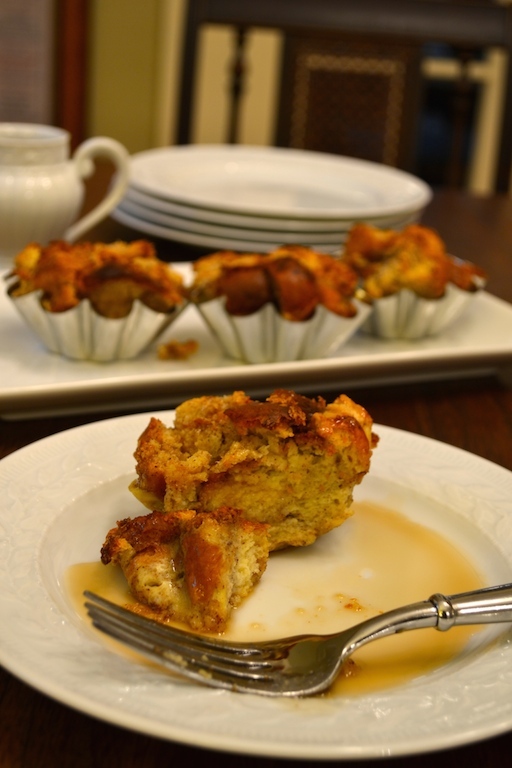 Allow the Baked French Toast to cool for 5 minutes before turning them out onto plates if using ramekins, brioche tins, or muffin tins. 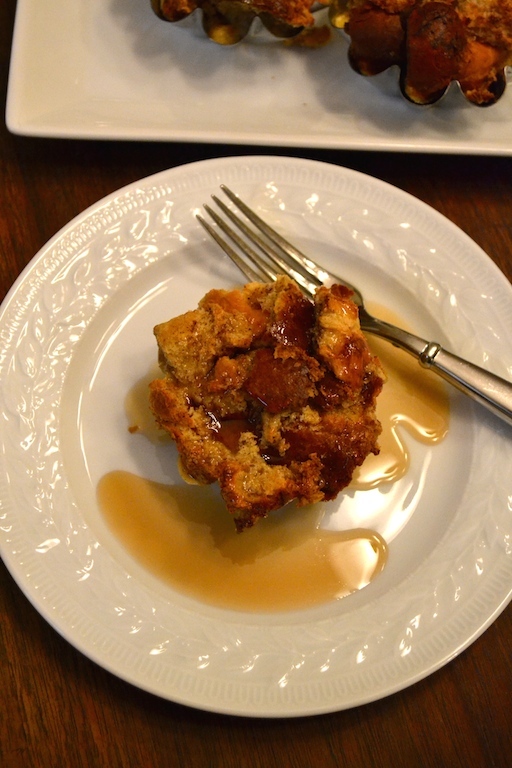 If using a casserole dish, simply serve the Baked French Toast in the dish. 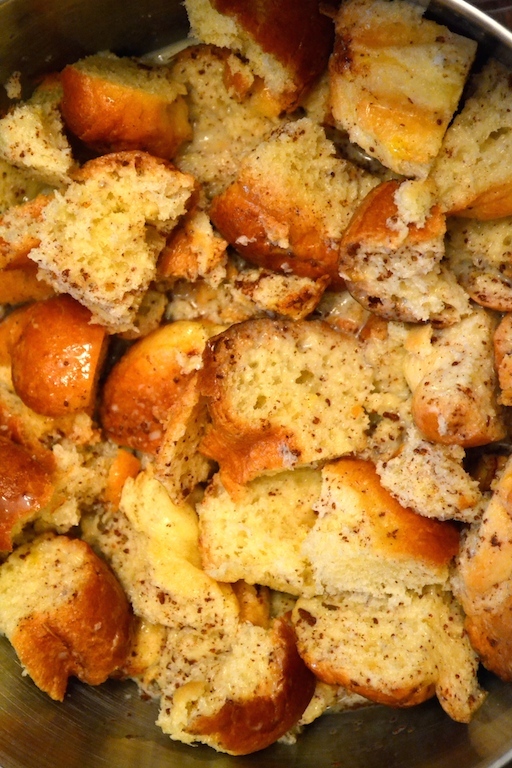 Baked Brioche French Toasts should be served with maple syrup and a strong cup of coffee.